In large industrial plants where a great number of machines are installed, it is necessary to implement an effective lubrication-management system. This type of system can help ensure that machines are well-lubricated and, if a fault or any abnormal situation is detected, further analysis or a corrective action can be carried out. 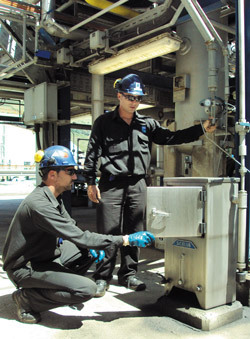 To make the system work, a machine database with well-defined lubrication points and scheduled lube routes is required. It is also essential to make good use of the data collected daily by the lubrication crew. If this information is promptly introduced into the database and generates an alarm when the machine is in poor condition, the reliability engineer can fix many potential problems. Lubrication routes and preventive maintenance (PM) can be modified automatically by lubrication software based on simple oil analysis and field inspection information provided by the lubrication crew. These tailored routes can improve effectiveness by focusing on critical machines, which are checked more frequently depending on the condition of the lube oil and the lubrication system. Before providing details on tailoring lube routes, let’s define what an effective lubrication-management system is as well as its main objectives. Generally, the purpose of a lubrication-management system is to schedule and plan the lubricating tasks of the machinery in the plant and to properly manage the field information supplied by the lubrication crew. The correct grade of lubricant also should be delivered to the proper lubricating points in the right quantity and on schedule to optimize the human and material resources. This first step involves recording all the machines to be lubricated in a database, along with their lubricating points and the appropriate lubricant. The database should be flexible enough to adapt to such changes as machine revamps or oil type upgrades. It should also allow for the historical recording of incidents that are documented on the lubrication routes. A field inspection should provide information on the lube oil system conditions and the mechanical condition of the machine. Once a machine database has been developed, the location of the lubricant service stations and the machines that use those lubricants must be studied in order to optimize the distance travelled by the lubrication crew. At this point, it is also important to standardize the lubricant types to a minimum that meets the machine manufacturer’s requirements. The lubrication specialists or the reliability engineers must create the lube routes. These routes consist of a series of points to be lubricated (divided into geographical areas or into production units) with related tasks to be performed on a detailed schedule. 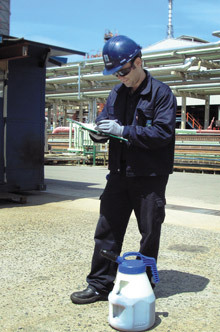 A template can be designed for use as a lubrication guide when performing field work. The template should include all the relevant information for the lubrication operators such as identification numbers of the machines to be inspected, lubricating points, the lubricant to be used at each point and tasks to be performed. There should also be open fields in the guide table in order to note any observation or anomaly detected. Lubrication work orders should be generated with a frequency that allows for proper planning of the work and should be delivered with the specific work plan attached. Also, be sure to print and detail the work plan for the personnel who will actually carry out the job to avoid unscheduled work and downtime. This template was designed for use as a lubrication route guideline. It is important to decide which members of the staff will be in charge of lubricating the machinery to avoid delays in the task execution. Keep in mind that in this type of work, any problem will affect all subsequent lubrication routes, which can cause serious damage to machinery. 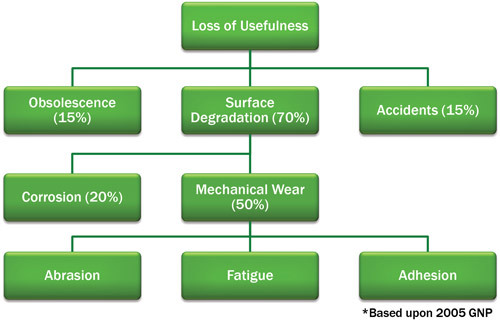 If all of these steps are followed during the implementation of a lubrication-management system, it will be much easier to achieve the desired result in terms of machine reliability. Once the lubrication plan has been created and the material and human resources required are clear, it is essential to utilize qualified personnel (or contact a qualified lubrication company) to carry out the lubrication tasks. Qualified personnel is needed not only to perform good quality work but also to provide reliable daily information regarding the lube and mechanical condition of the machines inspected during the route. 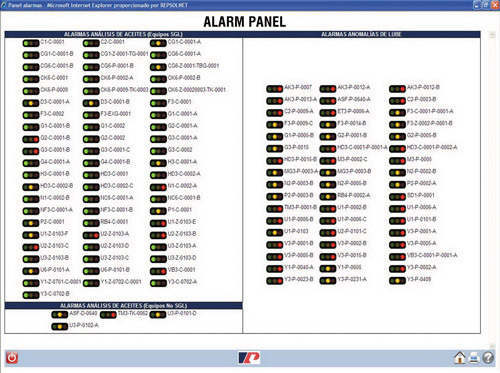 This is an example of a lube oil alarm panel. 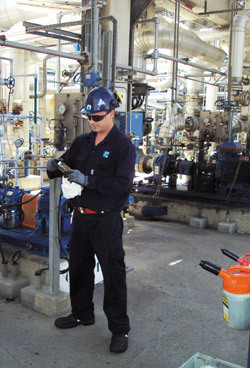 Carry out simple corrective maintenance jobs related to the lubricating systems. Perform quick visual inspections of the lube oil quality (moisture, particles, color, debris, etc.) and report its status in the lube route guideline table. Ask his or her manager or the reliability engineer about further analysis of critical machines that are considered to be in poor condition. Report any other observed anomaly that could affect the machine or personal safety. The information collected about the machine’s condition must be reliable in order to allow for a complete subsequent analysis by the reliability engineer. This is of great importance because any information reported by the lubrication crew will help the engineer focus his analysis only on the critical machines and their specific problems. This will save time and labor, as the field information is first filtered by qualified personnel, which simplifies the job of the reliability engineer. If special care is taken during the filtering of the field information to register all of the data consistently and with a coherent structure, the task of the reliability staff will be simpler and the historic data will be easier to search. condition of machines inspected during a route. 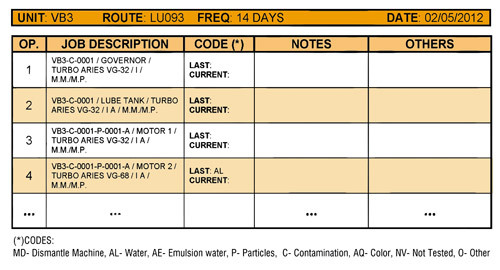 All of this information should be recorded by the lubrication crew in the report table of the route for the inspected machine. This data should be added to the system database as soon as possible in order to help the engineer promptly solve any problems detected within the machines. Remember, the reliability engineer takes care of the machines, and the faster the information is added to the system, the faster he or she can analyze the machine condition with the most advanced predictive technologies. By updating your lubrication-route software, you can automatically include in the next planned route every lube point that has been found to be in poor condition. With this automatic process, the lube points that are deficient are revised more frequently until the correcting actions have the desired effect. An alarm system for the machine’s lube condition can also be implemented based on the information collected from the lubrication routes. From this starting point, there are multiple strategies that can be implemented to optimize the lube-route schedule based on the machine condition and how often anomalies are detected. If an integrated system is employed, other information about the machine status can be used to improve the schedule and inspect the machines that are in poor condition more frequently. The difficulty lies in how to combine all of this data and find useful rules to be incorporated in the software. Any strategy should be in accordance with the general lubrication schedule and should not change planned work orders. The lubrication frequency of points in poor condition that need to be inspected again will correspond to the maximum number of lube points included in the same processing unit of the plant. For example, let’s say the available lubrication frequencies in one unit will be a multiple of a fixed number of days (15, 30, 45, 60 days, etc.). This method allows the mechanical workshop to manage only the planned work orders. The difference is that the number of lube points will be slightly increased depending on the machine’s oil status. The status of the lube point inspected in the last route can be included in the guideline table for the next route. This allows personnel to pay more attention to the most critical points. Any valuable information or pending work orders on the machine can be included in the guideline table and taken into account by the lube operator. Any automatic alarm or advice intended for taking further action like oil analysis, vibration measurements, etc., will improve the performance of the system. Other information based on the machine type and the organization of the reliability and maintenance departments can be utilized. If an organization has obtained reliable information from the lubrication routes, it is critical to process all of this data in order to optimize the frequency of machine lube inspections. This is especially effective if you have lube points that are in poor condition and require more frequent inspections. Inspecting problematic points more often ensures better control of their status and helps the reliability engineer to take corrective action sooner. 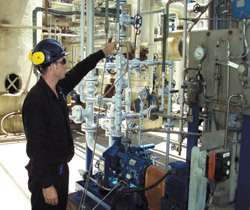 Also, if the industrial plant has a computerized reliability system with predictive, preventive and other related machinery condition information, the combination of this data (such as vibration and oil analysis) will allow for improved system performance, as more complex and effective strategies may be used. As I’ve gotten older, I have tried to curtail my consumption of fast food. I’m aware that the fat content, calorie counts and general nutrition levels are not the healthiest available. I know that as we age, we should watch our cholesterol, our weight and make sure that we eat healthy. I also know that my diet will directly contribute to the length and quality of my life. With all that being said, I love fast food. I am usually pretty good at keeping a balance of healthy eating and not-so-healthy eating, but sometimes I just want something that comes quickly and cheaply even though it may not be the best thing for me. I recently decided to partake in some fast food in spite of the long-term potential health consequences. As I was standing in line reading the menu, I was watching the processes behind the counter. This particular restaurant was moving like a choreographed dance recital. It appeared that each person clearly understood his or her purpose and was executing flawlessly. 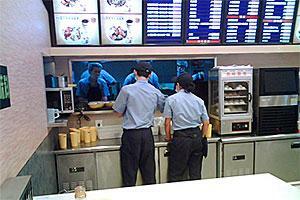 All too often, however, fast-food restaurants are rather hit or miss. You never know exactly what sort of food or service you may receive. In some cases, the employees move slowly, while in other cases, they may move quickly. Sometimes the food is hot and fresh, and sometimes not so much. Sometimes you get the feeling that the employees could not possibly care less about serving you, while others are courteous and concerned professionals. One of the challenges of fast-food chains is to drive consistency. In fact, this is a key challenge in all businesses. Consistency will drive customers back to us, while inconsistency will drive them away. Whether we are serving cheeseburgers, small electronics or large engineered systems, our customers want us to be consistent. They want to know what to expect from us, and they want to know that they can count on us. They want us to do what we say, not surprise them, and deliver high-quality products and services. It is up to us to build long-term processes that drive consistency and build that confidence in our organizations. So, if you have occasion to visit a fast-food establishment, or any restaurant for that matter, watch the processes if you can to see what they are doing. Try to see where things are located, how they are marked and how each process is defined. See if there is something you can learn from your favorite eatery — especially if they are good at value delivery. Ingression can be defined as a going in or entering, a right or permission to enter, or a means or place of entering. If you have attended one of Noria’s Fundamentals of Machinery Lubrication courses, I’m sure you understand the importance of reducing, minimizing and eliminating particle ingression. Because of the negative impact particle ingression has on equipment reliability, it is critical to recognize the effects, how particles enter equipment and what you can do to reduce or eliminate ingression. 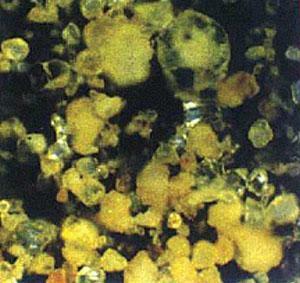 Particle ingression leads to contact fatigue, spalling, pitting, brinelling and cratering. 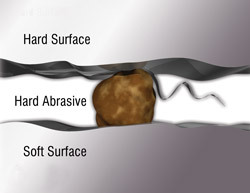 Surface fatigue often develops from denting due to hard or soft particles. This creates a stress riser (berm). Repeated high loading (stress reversals) on berms or particles causes surface fatigue and eventually the formation of pits. This leads to larger pits followed by spalls. Particles can enter equipment through various means, such as through a process or a mechanical service that is performed after a failure or inspection. Therefore, it is paramount to take all precautions to minimize or eliminate any contaminants (dust, water, etc.) from coming into the equipment. Most workers must deal with real-world conditions and may need to repair equipment out in the field. In these situations, take time to prep the area prior to opening an inspection door or bearing housing. This would include at the very least cleaning away debris from the inspection door or knocking off dust from overhead beams or adjacent machines. Often it is the little things that make a big difference. Maintaining a clean area as well as clean tools and performing proper flushing of the equipment to remove any debris left behind can increase machine reliability. You have to give your equipment the best opportunity to perform its intended function, and minimizing or eliminating in-service ingression is essential to achieve this objective. Ingression can also occur due to process conditions. This usually is the result of damaged seals or breathers and in-service equipment temperature changes, which can produce moisture within the machinery. Faulty seals can allow contaminant ingression, which may lead to surface degradation. Machinery inspections should be performed routinely. Repairs, modifications and purchasing improved seals may be necessary to improve equipment reliability. Keep in mind that not all seals are created equal. A proper assessment of your equipment as it pertains to temperature and the type of lubricant that you are using is crucial. Many times the lubricant and the seal may be incompatible, which can result in oil leaks. Remember, if you observe oil leaking out, there is an opportunity for contaminants to get inside the equipment. There are three general types of solid particle ingression: built-in, ingested and generated. Built-in contamination consists of manufacturing debris such as burrs, machining swarf, weld spatter, abrasives, drill turnings, filings and dust. It can also include service debris that occurs when machines are opened for routine repairs and preventive maintenance. Ingested particle ingression means that particles are coming into the machine and the lubricant under normal operating conditions (from the outside to the inside). These could be process particles (pulp, pulverized coal, ore dust, cement, clays, process chemicals, etc. ), atmospheric contaminants (the result of ambient or road conditions near the machine), or combustion debris from internal combustion engines (soot, fly ash, induction air and contaminated fuel). Generated particle ingression is when the machine makes its own particles. This can occur on internal surfaces through corrosion, mechanical wear, cavitation, exfoliation, etc. The oil also has the ability to break down and form particles (sludge, oxide insolubles, carbonization, coke, etc.). The selection of breathers and monitoring breather condition provide another method of reducing ingression. Whether you are using them to eliminate dirt or water ingression, breathers are imperative for machine health. They must be selected according to the machinery conditions and environment. Frequently, breathers are not monitored properly. Like oil filters, they have an intended purpose and function well; however, once they reach the end of their life cycle, it is important to replace them promptly. Remember, education is key. Understanding how ingression affects oil and equipment life is critical. Look beyond the obvious. 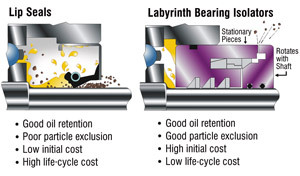 Whether it is a color change of a breather, oil leaking from a seal, or water ingression in the oil, recognizing the effects of ingression can help you act promptly to improve machine reliability. In many of the articles and books that are published today, you see a great amount of improvements in different industries and companies using different methodologies and tools. Many times, it seems that if you use the same tools or methods, you should get the same results. This is not always the case. There is an underlying story to a company that excels in making improvements, and that is the culture. I like to think of the culture as the foundation to effective operation. Culture includes leadership, initiative, teamwork and all of the other nice words we love to throw out. I am not going to give you some five-step process that will change your culture. What I will give you is a simple piece of advice, and that is to start communicating … always. What I am saying is to communicate with everybody you deal with and find out what drives them to do what they do. Shared goals and attitudes are not just sent down from above but are also influenced by the bottom or true foundation of the organization. Remember that the deck-plate workers are the value-adding group for the company and should be a driving force to set the culture and communication. The management and executives should be the facilitators of the communication process. You will find that programs and projects will start to run more efficiently, and the atmosphere will change. Keep in mind that this is not an overnight change. It will require time and hard work. Take a bite of humble pie and start talking to those around you to find out what their purpose is and where their beliefs are leading them. Sixty years ago a truck engine oil drain (or oil change) would have been performed as frequently as every 500 miles. Because of higher quality lubricants, cleaner fuels, improved filter technology and more dependable engines, today it is possible to have an oil drain interval as high as 50,000 miles or more on these same types of vehicles. Engine Design, Age and Conditions – Engine design characteristics and numerous running conditions can affect oil life factors from exposures to contaminants and other conditions. Driving Patterns and Conditions – Where and how the truck is driven. Oil Properties – Quality and formulation performance of the engine oil. Engine fuel efficiency is perhaps the most directly correlated factor to the life of the engine oil. It is improved by combustion efficiency, which can determine the type and amount of particles that are blown by the piston rings. Piston “blowby” is usually the primary source for ingression of contaminants into the oil. This can include dirt, water, soot, fuel, nitrogen oxide (NOx) and partially burned hydrocarbons (HC). Not only does the combustion efficiency play a role, but other engine design factors such as seal efficiency, temperature control and emissions control methods influence the type and concentration of contaminants in the oil. Some measureable engine characteristics such as total operating hours and mileage are unavoidable and will likely lead to a shortened oil drain interval. However, maintaining a healthy oil-flow system is manageable by consistently providing sufficient filtration and seals. In critical components such as filters, the failure mode does not stop with merely a shorter oil life when subpar conditions are experienced. Figure 1 shows how poor filtration can produce a chain reaction of damaging effects on the engine as well as higher operational costs. Filtration is the counter to contamination. Therefore, it is important that the dirt-holding capacity of the filter be in-line with the anticipated or needed oil drain interval. In addition to filtration and seals, another engine characteristic that has an effect on oil drain intervals is the oil capacity or sump size. Basically, with an increased volume of engine oil circulating within the engine, there will be a decrease in contamination concentration. Larger sump size also means more oil additives and less thermal distress. As a result, engine manufacturers that offer the largest sump size generally allow for the industry’s longest recommended oil drain interval. While all engines are designed to provide healthy conditions for the oil to flow, even the best designed models have some level of anticipated contamination over time, either generated from internal or external sources. 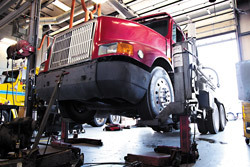 Consequently, it is the responsibility of the truck owner to ensure that optimal maintenance and healthy conditions are stabilized. 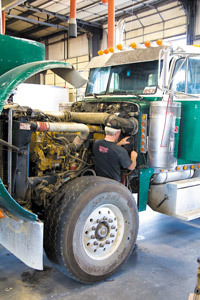 The conditions an engine oil must endure are reflected in the conditions the truck encounters. Driving in extreme temperatures, for example, is not a healthy environment for the engine oil. On the one hand, cold starts can cause the oil to thicken, which can impair bearing and cylinder wall lubrication at start-up. On the other hand, high heat environments will not only lead to a drop in viscosity but can also result in harmful chemical reactions such as oxidation within the oil and shorten oil life. Additionally, severe external conditions like dirt roads and high air humidity increase the probability that these airborne contaminants will invade the oil, usually by way of the air intake and through the combustion chamber. While engine oil has the potential to become contaminated by several external conditions, any factor that influences fuel efficiency also affects the life of the oil. Lower fuel efficiency implies that your engine is not operating at an optimal state, which forces it to work harder. As a result, your engine oil is also working harder. Some of these fuel-efficiency factors include steep roads, high loads, stop-and-go driving, lugging and even the style of driving. The trucking industry has come a long way in the past 60 years. 1949 Oil Drain Interval: According to its maintenance guide, Gulf had an oil drain interval recommendation between 500 and 1,000 miles. 2012 Oil Drain Interval: Today, the oil drain interval may be as much as 50,000 miles. Where and how heavy-duty trucks are driven can result in a range of fuel efficiency from 2 to 7.5 miles per gallon (MPG). The MPG number is a useful indicator for determining the engine oil’s duty cycle. 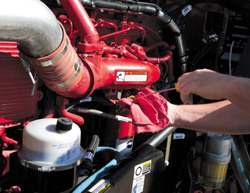 Engine manufacturers such as MaxxForce and Cummins have recently decided to recommend an oil drain interval based largely on the vehicle’s fuel-consumption rate. Figure 3 shows how the oil drain interval for the 2010 MaxxForce engines can range from 18,000 to 40,000 miles. This is significant compared to the previous non-varying recommendation of 25,000 miles, which was the standard guideline for years. Now, not only will better fuel economy save you on gas, but it should also save you on engine oil consumption. Diesel engine oils licensed by the American Petroleum Institute (API) and the European Automobile Manufacturers Association (ACEA) are formulated to provide the best engine-protecting properties and to deliver the longest service life possible. However, even the highest quality oil can be challenged by a range of factors that escalate its own degradation. Not only are the initial conditions (cleanliness, age, etc.) of the engine oil critical but also whether the right performance grade of engine oil is selected to counteract the stressing conditions and exposures that can shorten an oil’s life. Although one tiny particle might not seem too destructive, it has the power to single handedly generate as many as 20 new particles from the time of ingression to when finally removed, obliterated or settled away. After repeated exposure to particle ingression, contaminated oil may appear to act more like the engine’s deathblow than its lifeblood. Figure 3. The oil drain interval for some engines can range from 18,000 to 40,000 miles. Sludge and Soot – Formation of sludge deposits through a combination of solid contaminants and moisture results in increased engine wear and shortened oil life. Water and Coolant Ingression – Moisture, glycol and acids promote corrosion, additive depletion and oil oxidation. Fuel Dilution – As fuel becomes diluted, oil films can thin, promoting oil oxidation and loss of viscosity. Premium engine oils, which are typically synthetics, are advertised to improve performance like fuel economy, startability and overall engine cleanliness. However, if the objective is to achieve the best engine protection while being cost-effective, then a premium engine oil is not always the answer. This argument is similar to the decision of whether to buy a hybrid vehicle. For instance, if a hybrid provides “X” amount of fuel-economy improvements and costs you “Y” more to purchase, it will take you “Z” years before the cost-savings benefit applies. If “Z” is long after you sell the vehicle, you will have lost money. Likewise, premium engine oil provides “X” benefits, costs you “Y” more and will take you “Z” amount of time to reap these benefits. Sometimes “Z” is long after another unforeseen or uncontrollable failure occurs, resulting in a premature oil drain at the very least. Since viscosity varies with temperature, it is important that the engine oil maintains a suitable viscosity across the full range of operating temperatures. To achieve this, high molecular-weight additives such as viscosity modifiers (or VI improvers) have thermal-viscosity characteristics that reduce the rate of change. Figure 4. Whether based on driving, engine or oil conditions, root causes can lead to an increased concentration of oil contamination and produce a shorter oil life and eventual engine failure. 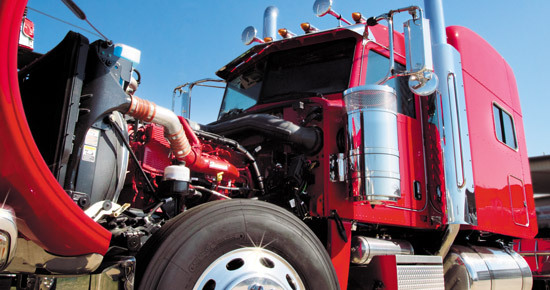 The standard engine oil for heavy-duty trucks has long been 15W-40. At this viscosity grade, the viscosity level is balanced between providing sufficient wear protection while minimizing the energy-robbing viscous drag forces. Nevertheless, if a newer, higher quality engine is used that is less susceptible to internal engine wear, then a lower viscosity engine oil such as 10W-30 or 5W-30 may become a preferred alternative since it will offer improved fuel economy and oil drain intervals. 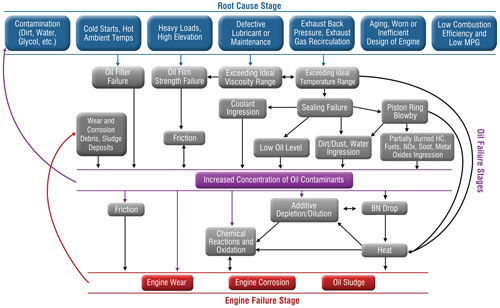 Figure 4 shows how these root causes, whether they are based on driving, engine or oil conditions, can lead to increased stress and oil contamination, thus producing a shorter oil life and eventual engine failure. Any one of these root causes has the potential to adversely affect the oil drain interval. Keeping the engine oil running smoothly and cleanly is key to increasing the life of the oil and the engine. The optimal time to change the engine oil is the moment when the damaging effects of the deteriorating oil conditions are more significant than the costs and time saved by extending the interval any further. These damaging effects can be either short term or long term. Short-term effects include the loss in fuel efficiency from the declined condition of the engine oil until the next oil drain. Long-term effects involve permanent damage of internal engine components, which leads to costs related to repairs, rebuilds and downtime. When the engine oil’s attributes degrade to its condemning limit. When there is a loss of base number (BN) associated with lubricant conditions leading to internal corrosion. When agglomerated soot and sludge begin to form and there is a potential for it to settle or attach on internal engine components. However, since these conditions are not always known through normal truck operation, the best answer lies with the operator’s ability to monitor the quality of the oil at any given moment either in real time (on-line sensors) or periodically by oil analysis. Thorough operating and maintenance records including MPG, oil type, maintenance logs, make-up oil volume, driving patterns, idling time, run time/distance, etc. One of the main properties of an engine oil is the ability to neutralize acids. To help improve this ability, engine oil is formulated with alkaline additives (typically detergents). This alkalinity, which can be measured as the BN, provides a good evaluation of an important aging property of the oil. This is because the BN will drop as the oil begins to oxidize or become excessively contaminated with glycol or acidic combustion blowby. Just as fuel efficiency may be the single most influential factor that decreases oil life, BN is perhaps the single most reliable direct measure of engine oil degradation. Other important factors include soot load, soot dispersancy, contamination and additive depletion. 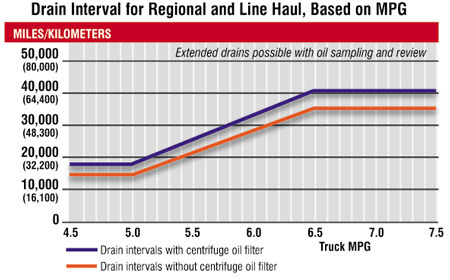 When estimating the optimal oil drain interval, fleet owners and owner-operators have different challenges and advantages. Fleet owners can utilize a large number of data from common routes to develop truck-based and route-based trend analysis, which can be very reliable. Owner-operators of trucks driven solely by one or two people can make reasonable estimations due to the driver’s understanding of the vehicle’s tendencies and operating history. The operator’s ability to monitor the driving style, operating environment (e.g., climate, ambient dust and terrain), selected engine oil and filter, engine efficiency, etc., can also help achieve the optimal oil drain interval. The health of the engine oil is critical to the health of the engine and the vehicle as a whole. In many ways, the engine oil in a vehicle can be compared to circulating blood in the human body. For example, engine oil is circulated throughout various engine components to provide wear protection that keeps the engine functioning properly, helps maintain a good engine temperature, cleans out contamination, and contains characteristics that inhibit corrosion and improve sealing. Likewise, the blood in a human body is circulated throughout various organs to provide nutrients that keep the body functioning properly, helps maintain a good body temperature, cleans out metabolic waste, and contains characteristics that inhibit infectious diseases, bacteria and parasites. Engine oil is filtered by an oil filter, and blood is filtered by organs such as the spleen and liver. Blood is useful not only because of what it provides the body but also because of what it can indicate about the condition of the body. When a patient goes to the doctor with an unknown illness, the doctor will first try to determine the cause by using the known symptoms. If this is not enough, a blood sample can be taken and examined in a lab. The blood acts as a signature of the body as a whole, offering additional clues as to the cause of the illness. Engine oil provides this same kind of signature for the engine and all the components through which it flows. An engine may have observational symptoms of how well it is operating, but sometimes these are not enough to indicate engine failure. If an oil sample is taken and examined in a lab, the particles found can offer clues that could predict failure long before any signs are observed. While understanding the condition of the engine oil in order to detect clues of an engine failure is important, the changing condition of the oil is also a means of failure. To identify the optimal oil drain interval, consider all the factors and symptoms. Increasingly, vehicle manufacturers, including heavy-duty truck manufacturers, offer in-dash indicators to alert the driver when the engine oil needs to be changed. However, many of these are based solely on a single factor, such as mileage or engine hours, to assist the driver with when the oil was last changed. In some higher end vehicles, more sophisticated methods are utilized, including direct measurements, algorithm methods or a combination of the two. Direct measurements may employ a variety of onboard sensors through electric capacitance or a micromechanical resonator, which can detect and roughly measure the amount of contaminants in the oil. Algorithmic methods use several variables provided by the engine’s control module, including oil temperature change, oil level, miles per gallon and average miles per hour. 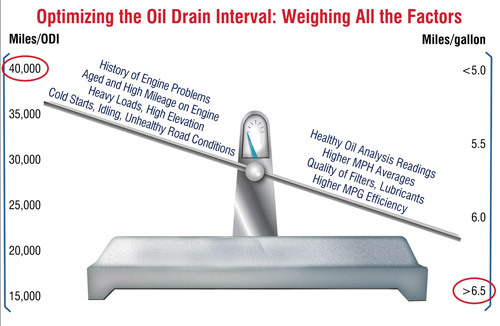 Figure 6 demonstrates how just two measurements (miles per gallon and average miles per hour) influence the oil drain interval. 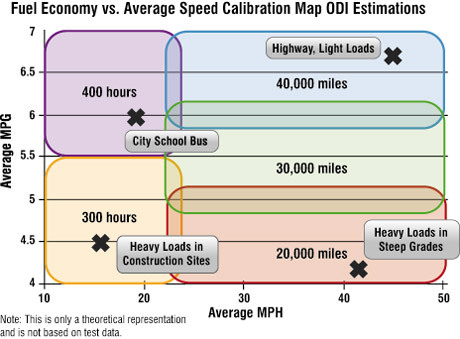 If a calibrated map similar to this was formulated with an algorithm incorporating all the engine oil factors mentioned previously, a more reliable method of pinpointing the right time for an oil change could be determined. The best part about this method is that all the information can already be supplied by the engine’s control module. If onboard sensors were included to provide more information about the contamination levels in the oil, then the reliability of this method could be expected to increase considerably. In summary, the end of oil life is influenced by a complex array of factors. Many of these can be monitored, controlled and used to optimize the oil drain interval. These include driving patterns, oil analysis, algorithms, onboard sensors or any of the other methods previously described. Furthermore, the benefits extend far beyond keeping the oil clean. Contamination in engine oil is damaging to the engine’s operation, but it can also provide clues to subpar engine operation, premature engine failure and less than optimal oil life. Many companies say they use standard work, but actually very few do, at least in the manner that leverages lean fully at the operational level. Instead, most firms use some form of work standards or work instructions. Frequently, plants trying to implement standard work within their lean efforts will do a kaizen event and, in the process of the event, develop and post a number of forms (standard work sheet, work combination sheet, etc.) at the new cell. This action is a helpful exercise for the event but does not really help with the performance and sustainability of standard work or the continual performance of production. The problem is that while the operators may be referenced to the new forms (this is what you need to do) or even involved in the development of the forms (the new standard work) during the event, this is not the purpose of the standard work forms or standard work for that matter. The forms are only for management, not the operators. This is where training within industry (TWI) comes in. The operators are not going to be able to perform the new standard work (even if they were involved in the development of the forms) to the level that it needs to be — to maintain the necessary stability of the process. TWI’s job instruction tool is the source of training operators in order to properly and consistently perform to meet the standard. TWI’s job method is the source of continuous improvement needed to develop and implement improvements to the process day in and day out. Traditional methods of training will not cut it. The development of good standard work is a fundamental key to lean success, but unfortunately most companies do not go nearly far enough with their effort — and, in most cases, are not even aware of this. If you want to be successful with standard work, there is no alternative other than TWI. Corrosion costs companies billions of dollars each year. Much of this loss is due to the corrosion of iron and steel. When exposed to moisture and oxygen, iron and steel will react, forming an oxide. This oxide does not firmly adhere to the surface of the metal and will flake off, causing pitting. Extensive pitting eventually results in weakness and disintegration of the metal, leading to failure. Obviously, because of the involvement with water, rust occurs much more rapidly in moist conditions. However, there are a few other factors that determine the rate of corrosion. One example is the presence of salt. Dissolved salt increases the conductivity of the aqueous solution formed at the surface of the metal and enhances the rate of electrochemical erosion. Another example is heat. The higher the temperature is, the higher the corrosion rate will be. 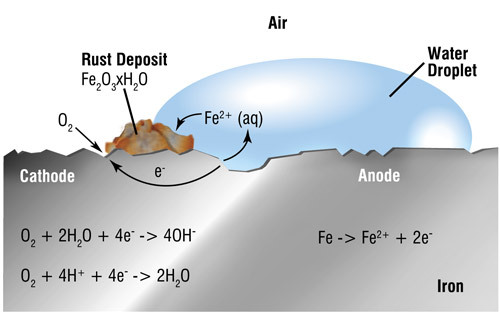 The formation of rust is a very complex process that begins with the oxidation of iron to ferrous (iron “+2”) ions. For the next sequence of reactions, both water and oxygen are required. The iron (+2) ions are further oxidized to form ferric (iron “+3”) ions. The electrons provided from both oxidation steps are used to reduce oxygen. The ferric ions then combine with oxygen to form ferric oxide, which is then hydrated with varying amounts of water. Other types of corrosion can occur in machine components, namely corrosion from organic acids. These organic acids can form in multiple ways and can even be a byproduct of the oil aging (oxidation). They are weak compared to common inorganic acids but still hydrolyze well enough to damage most metals. Corrosion inhibitors are available in many forms with various functions to protect equipment. Liquid-phase corrosion inhibitors ensure surfaces covered by the liquid will be protected by the strong additives in the fluid. Vapor-phase protection may be included with the liquid-phase protection or used in dry reservoirs. It works by filling the headspace with a vapor that prevents corrosion. Surface coatings protect systems by adhering to the surface. Generally, surface coatings repel water from the surface and include an additive to reduce corrosion at the surface. The best way to stop rust and corrosion is not to allow the metal to come in contact with water, oxygen or acid. In essence, this is exactly what rust and corrosion inhibitors do. These additives are typically compounds that have a high polar attraction toward metal surfaces. They chemically bond to the metal surface, forming a protective film over the underlying metal. This film acts as a barrier that does not physically allow the metal to come in contact with anything that could promote corrosion. Some popular compounds being used are amine succinates and alkaline earth sulfanates. If rust formation cannot be prevented, the rust particles can flake off and contribute to abrasive wear. The iron oxide is much harder than the steel surfaces it comes in contact with, so massive amounts of three-body abrasion occur. The rust-protective properties of an oil can be hard to evaluate and are somewhat subjective. For best results, the lab must polish or sandblast a test specimen and then immediately coat it with the oil to be tested. After coating, the lab can then begin subjecting the specimen to conditions that accompany rust formation. ASTM D665, although denoted as “Rust Preventative Characteristics of Steam Turbine Oil,” can be used for any formulation of oil. In this test, a steel specimen is immersed in a mixture of distilled or synthetic sea water. Over a 24-hour period, the mixture is agitated and checked for the formation of the onset of rust. Rust and corrosion are detrimental to your reliability program. Remember to always fight it at its root causes. Eliminate the root causes of a failure and you will reduce the likelihood of that failure’s occurrence. Training within industry (TWI) is a micro version of “creative destruction,” a term used by some economists to describe a free-market capitalistic economy. Creative destruction means that new businesses, services or products enter and create the new markets while destroying existing ones — with the overall result being beneficial. Kaizen is no different, but on a smaller scale. However, let me explain this in the context of TWI. I have done much research on industrial history, specifically on Toyota, Ford’s Highland Park plant, the development of accounting and TWI. In every case, many mistakes were made during the development of all of these ventures. Kiichiro and Sakichi Toyota, as well as Taiichi Ohno, all made some very costly mistakes from financial and personal perspectives, but the difference is that they eventually learned from these errors. They also never let these errors bring them down. Learning is suffering; it is not necessarily a victory — although that does happen at times. The deepest learning comes from suffering (i.e., failure). That is the philosophy behind PDCA (plan, do, check, act). By its nature, PDCA is an acknowledgment of failure, but a victory in learning. If PDCA was a victory, you would never have to go back through the cycle again, but that is exactly what PDCA intends for you to do. This is the process of learning: fail, learn, fail, learn, and so on. This will equate to a victory. The failure I am referencing does not mean that things go bad necessarily; it means that a solution or a perfect solution is not reached. This is why Toyota frequently refers to these “tries” as countermeasures. Counter the problem and measure the results, then try again and again (PDCA). This is creative destruction at a micro level and is exactly what TWI manifests both mechanically and philosophically. TWI is a mechanical means to achieve creative destruction — a pattern for a behavior. Once this behavior is learned and made into a habit, deep learning takes place and the learning cycle can become addictive. How does TWI achieve this? It goes back to the old analogy frequently used by Toyota folks using stair steps. “Job methods” is the vertical part of the step — the change, the improvement, the experiment, the “try.” “Job instruction” is the horizontal part of the step or the stabilization of the experiment upon some level of success (or learning). “Job relations” provides an environment where both the leader and the subordinate feel comfortable and confident to work together through this change-stabilization process, which is a learning process running parallel with the mechanical PDCA process of the stair steps. In this manner there is a symbiotic relationship between the organization and its people. The company gets an improvement (better performance). People get to contribute in a meaningful way and grow in knowledge and experience. Then each gets to further leverage the mutual benefit over and over again, thus making both better through many tiny creative-destruction cycles. For anyone interested in further discussion and information on this process, I highly recommend Steve Spear’s book, Chasing the Rabbit. He gives excellent examples and descriptions of how and why this process works. The enemy to any lubricated machine is particle contamination. In a perfect world, machines would be sealed up to block the ingression of particles before any problems occur, but unfortunately this isn’t the case. We live in a dirty environment. Particles exist everywhere, and lubricated components are constantly under attack from them. Whether the particles are ingested by poor-quality breathers or dirty oil from a recent top-up, the question remains what can be done to get rid of them. The obvious solution is filtration. Filters can extend the life of machines by removing harmful particles before they can cause surface degradation of the lubricated components. There are two common types of filters: surface or membrane filters and depth filters. Surface filters simply trap particles on the surface or face of the filter. Depth filters allow the oil to flow throughout the body or depth of the filter and trap particles throughout the media. Perhaps the most crucial attribute of any filter is the ability to trap and hold dirt. Each filter has a specific pore size. This is the size of the openings within the media through which the oil and particles can pass. As the pore size gets smaller and smaller, the differential pressure across the media begins to increase as well. This differential pressure can lead to a condition in which the bypass or cracking pressure of the filter is reached, allowing oil to flow through virtually unfiltered. Also, if the pressure becomes too great, it can cause the actual filter media to burst. Once particles are captured, it becomes a measure of how well the filter can retain them. This is known as the dirt-holding capacity of the filter. Several factors contribute to how well filters hold the contaminants they catch. We’ve discussed the pore size of the filters, but pore density is equally important. Pore density can be described as the number of pores in a section of the filter. This is also known as the porosity of the filter. As pore size goes down, to maintain a low differential pressure across the media, the pore density must go up to account for the volume of oil in contact with the surface. Thus, filter depth and size also affect the dirt-holding capacity. Another thing to keep in mind when selecting filters is the material the media is composed of. This not only has an effect on the longevity of the filter and its adaptability to its environment but also its dirt-holding capacity. Two common types of filter media are cellulose and synthetics. Cellulose is comprised of wood pulp. These types of filter media have a large fiber size and a less consistent pore size throughout the entire filter. Cellulose has the advantage of being able to absorb some water from the oil it is filtering. Cellulose filters tend to fail quicker in acidic environments as well as in high-temperature applications. Synthetic filter media generally have a higher dirt-holding capacity than cellulose. This is due in part to their more consistent pore size throughout the media. 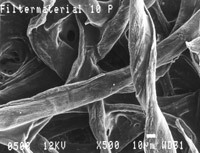 Synthetic fibers are smaller than cellulose fibers, so they can be packed tighter together, creating more pores in which to trap and hold particles. 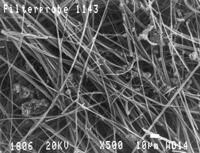 Synthetic fibers also perform better in the harsh environments that tend to destroy cellulose filters. In examining the technical sheets of filters, you may have seen a filter’s beta rating. This describes how efficient the filter is at removing particles. There also may have been a value for the dirt-holding capacity. This value is obtained through a test known as ISO 16889 or the multi-pass test. In this standard test, a filter is put into a circuit that is filled with oil. The oil circulates through the filter. A set amount of sized particles is then released into the oil to test the filter’s ability to capture them. A particle counter before and after the filter measures the difference in particles. The results of this test will allow you to see how well or poorly a filter performs against different particle sizes. Keep these things in mind when selecting the next filter to clean your oil and protect your expensive machinery. Check the filter’s beta rating and pore size. Obviously, there is a big difference between a 40-micron filter and a 3-micron filter when you are talking about the size of particles allowed downstream. Also, whenever available, verify the results of the ISO 16889 multi-pass test. This not only will show you the efficiency of the filter, but also how well it is able to retain the particles it removes from the circulating oil. Some filter manufacturers don’t show the results of this test as it pertains to the dirt-holding capacity of the filter, but by pressuring them and demanding to see the results, you can make the best decision for you and your machines. If they balk at the idea of providing the test results, there are labs across the country that can run the ISO 16889 test on the filter to give you the results. This is more expensive for the end user, but it offers the peace of mind that you have the right filters for your applications. Selecting the proper filter with a high dirt-holding capacity is only half the battle. You also must ensure these filters are put into use the right way. Filters can be expensive, so naturally you want to prolong the life of the filter to cut down on the costs associated with changing them. One of the easiest ways to prolong the filter change-out interval is by simply oversizing the filter. As you can see in the chart above, by doubling the surface area of a filter, you can expect three times the life from it. There are different methods to oversizing filters. The most obvious is by increasing the physical size of the filters you are using. This is somewhat costly, as equipment modification is required to fit a larger filter in the lines. For some equipment where space is limited, this may not even be feasible. That is when you should start looking at putting filters in parallel. By placing multiple filters in parallel, you double the surface area in contact with the oil, thereby reducing the face velocity (the pressure of the oil on the surface of the filter media), and thus extend the life of the filter. This means less filter changes and the ability to capture more particles between change-outs. If the equipment won’t permit the extra piping to put in a parallel circuit, there are systems that stack filters one on top of another to increase the overall length of the media, again allowing for the decrease in pressure the media is experiencing. If your backlog is piling up or you feel like you don’t have enough resources in terms of labor and parts, it may be time to work toward lean maintenance. Lean maintenance is the application of lean philosophies, methods, tools and techniques to maintenance functions. It has the fundamental goals of eliminating waste associated with labor, inventory, procedures and techniques, resulting in improved productivity and reduced costs. Following are a few areas where wastefulness and sluggishness can crop up in the maintenance department. Overproduction in the maintenance environment means doing any work that does not add value. Examples include performing preventive and predictive maintenance tasks more often than is necessary and redoing jobs that were not done correctly the first time. Areas of waste in this category include maintenance personnel waiting for equipment availability, job assignments, tools, parts, instructions, other crafts, permit approval, etc. Waiting is not a value-added activity and should be eliminated or reduced as much as possible. Unnecessary travel is the result of ineffective planning and scheduling. This could involve a trip to the maintenance shop to get technical information or to the storeroom for parts and tools. Poorly designed preventive maintenance (PM) routes are also a major contributor. When performing a breakdown repair, maintenance personnel are typically under a lot of pressure to fix the equipment as quickly as possible and often are not given enough time to fix the equipment properly. This results in a poor repair and a recurring problem. Properly performed repairs can eliminate this process waste. Most organizations now use some sort of computerized maintenance management system (CMMS) or enterprise asset management (EAM). Process waste also occurs when inefficiencies exist in these systems. For example, a poorly designed system may call for multiple entries of the same data, or a material requisitioning process could require redundant approvals. In maintenance, a defect can be defined as leaving an asset in an unreliable condition. There are many causes of defects in the maintenance environment. Defects due to poor workmanship arise from insufficient training, inadequate/outdated procedures and not having the proper tools to do the job. Most storerooms contain a significant amount of obsolete inventory. This ties up capital and consumes management resources. It can easily amount to 10 to 20 percent of annual inventory dollars. Keep in mind that excess inventory is not obsolete but is inventory maintained at unnecessarily high levels. Excess inventory also ties up capital and consumes management resources. In addition, inadequate PM programs cause equipment failures, which in turn results in the need for more parts (consuming working capital) and downtime. A CMMS/EAM can monitor and control a spare parts inventory. It will keep track of inventory items, vendor performance, parts receipts, issues and returns. In addition, a CMMS/EAM can automate the parts purchasing process. Vendor managed and stocked inventory can also drastically reduce the parts quantity in the storeroom and save money. While breakdowns and failures are never planned, they can cause the loss of productivity and money. Finding the root cause of a failure provides an organization with a solvable problem. Once the root cause is identified, a fix can be developed and implemented, preventing a recurring failure situation. I became a skeptic of overall equipment effectiveness (OEE) when I saw the performance on the midnight shift at a well-run plant nosedive. The low OEE was on the shift performance dashboard and attracted undue attention. Local plant management blamed maintenance, and the maintenance manager called me to support him. An investigation showed that operations had decided one employee could operate a machine that regularly required two employees. In fact, sometimes they assigned one employee to operate two machines. Usually, one employee would keep the machine fed and cull out poor feedstock, while a second would remove the processed product and clear the jams that occurred every 10 minutes for about 30 seconds. OEE was down to about 40 percent for equipment that usually achieved 70 to 80 percent. Further investigation revealed a wider batch-processing window than on the other shifts. The bottom line was that the labor cost per unit processed was reduced by nearly 40 percent while meeting production timeframes. Operations really did not know the makeup of OEE, and instead of defending their numbers, they chose to cast blame. That is the quick two-penny version. Who uses OEE? Hopefully, it is used by those who know what the three factors mean and how they are measured. My experience says there are various levels of OEE. OEE was thought to be the miracle metric by some organizations, and a lot of management attention still is paid to the metric. I submit that the metric at a plant level means squat to the line operator — and plant level was the original use of OEE. Yet it is this operator and his or her maintenance technician that makes or breaks the company during the operating shift. 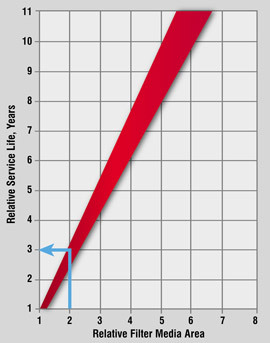 Could an OEE be developed that was a meaningful metric to the line machine operators? How about for the engineers and process developers who established equipment performance and line-balancing parameters? How about the supervisor who oversees a production of machines in series? How about the planners and schedulers? In other words, specific OEEs could be developed that represent the specific impacts various players have on the plant performance. I’ll even go one further. How about the finance guys who watch the pennies? How about human relations? Most companies recognize the importance of customers, employees, resources and the bottom-line budget performance. It not possible to separate them, yet each must be managed. In the late 1990s, my old organization searched for a meaningful metric to gauge employee motivation and satisfaction with the workplace. The usual factors of safety, attendance, Equal Employment Opportunity (EEO) complaints and grievances were numbers that alone could not be individually correlated to performance. As we moved out of the 1950s and into the enlightened times of the late 20th century, the old term KSA (knowledge, skills and abilities) did not seem to be the end-all when dealing with workers. We wanted them to no longer leave their brains at the front door. We wanted the whole person on the job. Empowerment, quality of working life, involvement, and the importing back into U.S. industry of Deming’s and Crosley’s quality concepts caused an upheaval in how management must view and treat the worker. Then came total productive maintenance, lean, Toyota, process management and a host of other programs. The literature began to talk of employee talents, situational flexibility, learning organizations, systems thinking, self-direction and self-motivation. My organization categorized this as employee willingness. Yes, we hire a person that walks through the door with KSAs. What happens to his or her willingness or desire to produce to his/her finest? Can we measure that, and what do we need to help him or her walk out of the plant at the end of the day feeling satisfied? I once had a manager who said that if we provide the right tools and timely, pertinent information, then employees will work. That means the organization exists to support the employee. OK, so how does all of this hot air relate to OEE? It can be timely information. It can identify training and skill problems. It can indicate process and equipment problems. And, it is a barometer of employee willingness. Should, therefore, OEE be an analytical metric? Absolutely. Otherwise, throw it away. The bottom line was that OEE became a top-level workforce metric for plant management. At the same time, all processing equipment produced (in real time) the OEE that the operators managed to gauge their performance and analyze problems. The biggest issue was to train supervisors and superintendents to use the same OEE as a diagnostic tool to help remove obstacles to operator performance. The directors of HR were now held responsible for understanding OEE and how it should be viewed and used. It was no longer an “operations problem” but a plant-wide tool to recognize employee excellence.